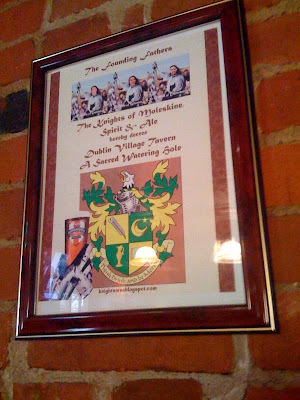 Knights of Creativity Spirit & Ale: Happy Founders' Day! Today marks the 2nd Anniversary of the founding of The Knights of Moleskine, Spirit, and Ale (and they said it would not last -- whoever "they" are). Day with the crew here. I'll be traveling today. Founded in Evansville, Indiana on April 18, 2007, during the Cinco de Mayo Mini Beer Tour at Old Chicago, the Knights of Moleskine, Spirit and Ale are dedicated to Journaling, Drinking Good Beer and a Spirtual Way of Life. "Libertas de Juditium. Unitas per Variantia." May all your days be Knights days. Just found you recently, but wanted to wish you a Happy Founders Day! I'm looking forward to the KMSA becoming more encompassing, inclusive and Dynamic in the next year...and hearing from more of my fellow Knights and Ladies... woo hoo. The title of Lady would honor me completely. My blog is humble, but you're welcome to stop by anytime. Lady Howard of Pickerington...By now you know that I have visited one of your well done blogs and posted a comment, along with the official title of Lady of the KMSA, and an invitation to make a pilgrimage with your friends to the Dublin Village Tavern, since you are closer than I. You'll see our plaque on the brick column at the center of the bar. Raise a glass to each of us and you are officially in!